In Okinawa, Japan the Cherry Blossoms (桜) differ in a few ways from those you'd see in the mainland of Japan. Up there in the north, they don't bloom until the spring thaw warms the earth. Down in Okinawa our Cherry Blossoms need a good cold snap to get the trees budding. It'll happen, any day, now. That isn't the only difference between Okinawa and the rest of Japan's Cherry Blossoms, though. When the flowers do bust out all over the mountains they do it differently than what most other Cherry Blossoms do. The flowers up north open and spread their petals towards the sky. Down south, our Cherry Blossoms do what makes it easier to view them without climbing up a ladder. They hang down like bells. The petals of our Cherry Blossoms face the ground where anybody can see what's inside without having to climb a tree. 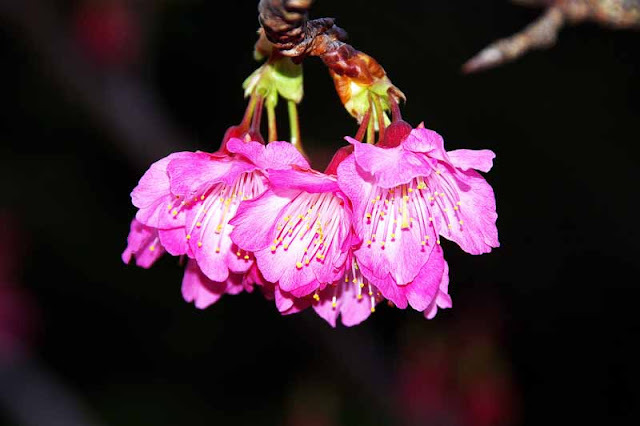 OKINAWA'S CHERRY BLOSSOMS (桜) PRACTICE GOOD OLD SOUTHERN HOSPITALITY ! This photo was taken JAN 2010. Another from JAN 2009 is PHOTO OF THE DAY on my website homepage until this time tomorrow but, always available in the photo gallery if you missed it.